Taking a balanced combination of vitamins and the trace element iodine can serve as an ideal food supplement in many situations, for example in times of stress, at an advanced age, in case of physical activity or in an unbalanced diet situation. In order to reduce infantile neural tube defects, scientific associations recommend supplementing 400 µg of folic acid per day (at least four weeks before a pregnancy begins). Since iodine is also essential for the healthy development of a child and if the supply through the regular diet is insufficient, pregnant and lactating women are also recommended to take additional iodine*. Vitamin D is essential for the normal formation of bones and teeth and for the absorption of calcium and phosphorus from the gastrointestinal tract. The B vitamins help the process your body uses to get or make energy from the food you eat. This is called metabolism. They also help form red blood cells. *To be confirmed with a doctor. 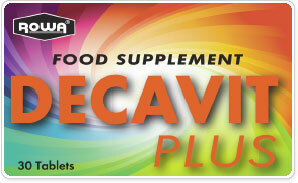 Consult with your doctor if you are on medication before taking any supplement.